Winter Flight Cold weather flying in the Bakeng Deuce. It's about four o'clock in the afternoon and the temperature is hovering around 39 degrees. A light wind blows down the length of the runway. Clouds hang thin and high, too high to see them swiftly sailing east. With the exception of the bitter cold, the weather is perfect. 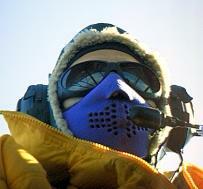 My flight attire consists of an army surplus nomex flight suit, a bright yellow down jacket, a ski mask and ski gloves. The down jacket is of a rare thickness that can hardly be found anywhere outside the far northern latitudes. Sitting in the cockpit with this thing is like sitting in a goose-down soup. Forget about seeing the hobbs meter on the lower left - or the circuit breakers on the lower right. A few minutes later I am at full throttle with three-thousand feet of runway ahead. Stick full forward, rolling, tail up, a little left then right rudder. In the cold, still air the wings are rock steady. Lift off. Set pitch for about eighty miles per hour. Hold a little rudder. By mid-runway I can barely see the airport buildings over the left edge of the cockpit. By the end of the runway I am six hundred feet over the numbers and rocketing upward at 1600 feet per minute! The clouds are blocking the low-lying sun, creating a timeless feeling. Although it's now nearing sunset the intensity of the light hasn't changed significantly since noon. The colors of sky and land are muted and blended - gray, blue and dark greens. I fly to the north and began climbing again once out from under the class C airspace of Richmond International Airport. Leveling around 3000 feet I see a business jet cruising far below me, heading for Richmond possibly, or maybe ducking below their airspace for a local municipal airport. It is strange to see a sleek, fast jet far below my primitive little craft. The slip-stream tugs at my collar. My nose burns from the cold air. I cover my nose with the ski mask and my breath is redirected into my goggles. My goggles fog and freeze. I uncover my nose. A few minutes with my nose uncovered brings fears of frostbite. Later on I got a better ski mask - problem solved. Below me are patchwork farms where I chased deer in the summer. The stark scenery of winter is all around. The fields are stripped and plowed. 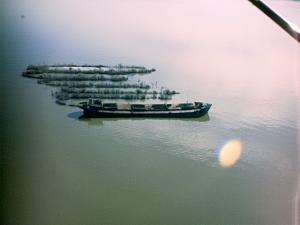 The river holds thin patches of blue-green ice. A light covering of snow lays in the shadows of trees and barns. 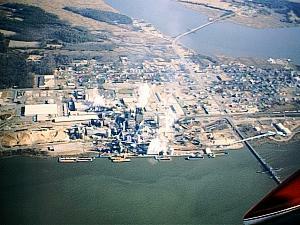 I follow the Pamunkey River east towards the puffing stacks and pulpy smell of a paper mill. The West Point Mill is a pulp and paper mill which creates a staggering 2,000 tons of paper product per day... four million pounds each day! It's history extends back almost ninety years. One of their specialties is something called "kraft paper" - the brown, high-strength paper from which our grocery bags are made. I'm not sure what comes out of the stacks at West Point so I stay up high and fly lazy circles around them. The mill is a Rube Goldberg nightmare with interlacing pipes, tanks and structures of all shapes and sizes. The horizon glows a slight purplish red now. It is too cold to even think about trying to expose my watch. I dial in the weather reporting station for a nearby airport. No need to extract the eastern standard time from the 24 hour Greenwich mean time they report. It's something-forty one and that means 4:41. Time to get back. The sun sets at five. The runway lights are on in the dimming light as I turn final. Eighty miles per hour, seventy five, seventy and hold it. A little right of the runway to see it better. The air is so thick at this temperature. Flare just above the runway. I don't worry about how far back the stick is. If I focus on getting the stick all the way back I invariably flare too high and float down. Instead I focus on attitude. Flare close to the runway, hold it off, hold it off and let it touch. Although this time I hold it off a bit too long. I realize this at the last moment as the wings lose their grip and I float down and slam onto the runway. Remember, any landing you can walk away from is a good landing... especially if nobody is around to see it. - Mark Williamson (1/7/2001) No copyright!